Okay,this was my newest work,Which I call "Project OO"
- Background : White,with Golden Gradient line.Given Color and Gradient Overlay Blending Opts.And also "Grain" Filter. - Techno layer : Black Techno Patterns on the background,given Gradient Overlay that was adjusted. - OO Big layer : The Big OO Gundam on the back,given Drop Shadow and "Color" type Color Overlay Blending Opts..
- OO Gundam Shade layer : The Black OO Gundam,was given Black Color Overlay and White Outer Glow Blending Opts. - OO Gundam layer : Given Outer Glow(white) and Satin(10%) Blending Opts. - Blade Portrait layer(Lower Left) : Given Drop shadow,Inner Shadow,Bevel % Emboss,Contour and Transparent Gradient Stroke Blending Opts. - Solar Furnace Portrait layer(Right) : Given Drop shadow,Inner Shadow,Bevel % Emboss,Contour and Transparent Gradient Stroke Blending Opts. - Face Portrait layer(Upper left) : Given Drop shadow,Inner Shadow,Bevel % Emboss,Contour and Transparent Gradient Stroke Blending Opts. - Gradient Line layer : the Gradient Line below the Name text. - 2 text layers.Given Drop Shadow and Pattern Overlay Blending Opts. Personally I think this was at it's best,and adding something else might ends up ruining it.I have tried removing the portraits,and it ended up really bad. 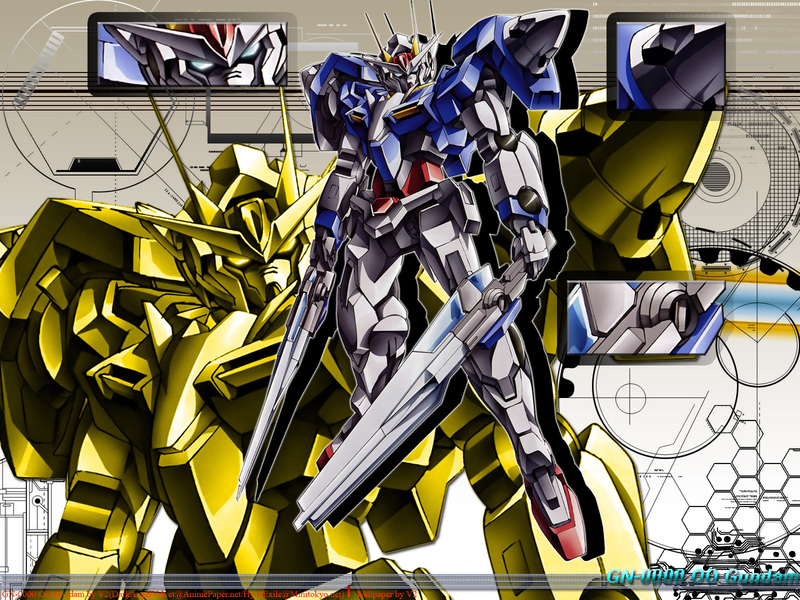 Impressive wallpaper for the OO Gundam. Who knows, the new Trans-Am system might look like this now. This walle is very cool! 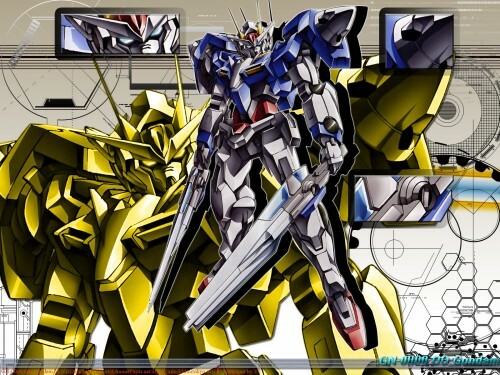 exia looks so cool. both full view and golden background.